Pitch automation is revolutionary. Think AutoTune, but integrated right into the sequencer. No one else has this. There’s a fun dynamic pattern sequencer. Pattern Gate is fun; it’s a 16-step gate with an integrated LFO. In English, that means you can create rhythmic patterns by changing the volume level of your sounds, but with added modulation. The former you can do with Live, the latter you can’t. If you’re doing scoring or working with Pro Tools, you need this. Read on for more details. Am I jumping up and down to use this? Not necessarily; I’m hooked on Live’s live performance and elegant music creation features, and Logic’s synths and effects. But this confirms my belief that there’s no one solution for everyone, and competition is good. More details after the jump. Pitch automation: Added to the automatic beat detection and slicing features from 4.5, now pitch is totally transparent: you can change pitch using Transpose or even the pencil tool, and automatically change the pitch of individual notes or entire tracks. Pattern Gate Plug-in: Now this is really freakin’ cool: a 16-step gate with some pretty nifty controls. Sure, you could do the same with Live’s clip editors — and, in fact, I do all the time — but there are some interesting additional controls here, with the look and feel and control of MOTU’s superb MX4 virtual analog synth. AAF Interchange with Pro Tools: One thing that impressed me about DP in my reviews below is its superb Pro Tools compatibility; support for the latest AAF interchange format is further evidence of that. 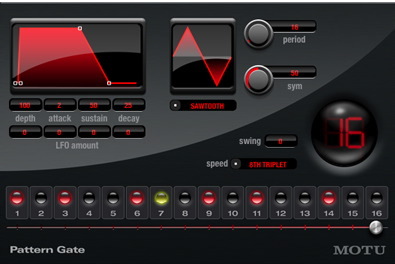 V-Racks: At first I thought this was like the Combinator in Reason, but, erm, it’s not. Basically, it lets you route multiple plug-ins and virtual instruments to different sequences. Bounce to QuickTime Movie: Add audio to a QuickTime video instantly, a la Apple’s Soundtrack Pro and, interestingly enough, the forthcoming Sibelius 4 notation software. Custom metronome click: Yeah, yeah. More cowbell. At least they beat me to the joke so I don’t hit it again. I expect Steinberg to strike back with a new physical-modeled cowbell from Yamaha. More scoring enhancements: Sibelius 4 could give it a run for straight-out notation, but DP is the flat-out best sequencer for scoring on any platform. Now you can open multiple movies per sequence in the same project, and Find Tempo (which was already great) has been improved. In a nutshell: DP users, get this right away. And this is still the best sequencer for scoring — ask Howard Shore (Lord of the Rings) and others. And it’s great onstage — ask the Black Eyed Peas. (More on that soon, in fact.) I’ve personally shifted over to Logic Pro for a lot of my work because I love Logic’s effects and synths. But it’s nice to see DP keeping the race tight. It reminds me of the old Performer vs. Vision fights in the early Mac days, or Cakewalk vs. Cubase . . . rivalries, mark my words, are good. Apple: your next move?